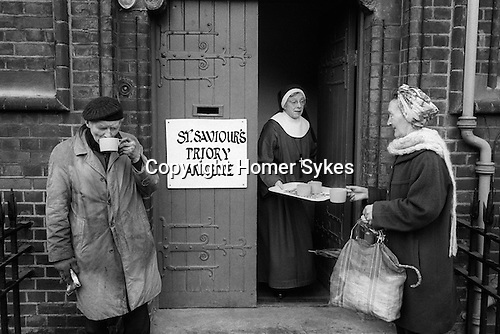 Sister Patricia hands out cups of tea from St Saviour's Priory annex, at the time a disused vicarage on the Kingsland Road, while the Priory was being refurbished. St Saviour's Priory is an autonomous House in the Order, which constitute the Society of St Margaret founded by John Mason Neale in 1855. The Sisters of St Margaret, explore contemporary ways of living the religious life in the community through a balance of prayer and ministry amongst marginalised groups; the homeless, alcoholics, and racial minorities who are in need.